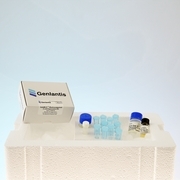 Genlantis has developed a different kind of protein delivery approach using a novel reagent called BioPORTER� protein transfection reagent. BioPORTER reagent is a unique cationic lipid mixture that is hydrated with a solution of the protein that is to be delivered. 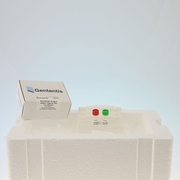 The BioPORTER reagent reacts quickly and interacts non-covalently with the protein creating a protective vehicle for immediate delivery into cells. The mixture is added onto cells and the BioPORTER/protein complexes attach to negatively charged cell surfaces. Following cell surface attachment the BioPORTER formulation fuse directly with the plasma membrane and deliver the captured protein into the cell, or alternatively, the BioPORTER/protein complexes are endocytosed and then fuse with the endosome, releasing the BioPORTER-captured protein into the cytoplasm. BioPORTER biological reagent is remarkably effective for delivering a number of different macromolecules into the cytoplasm of cells; it can deliver fluorescently labeled antibodies, high and low molecular weight dextrans, phycoerythrin-BSA (300,000 Mol.Wt. ), caspase 3, caspase 8, granzyme B, and b-galactosidase into the cytoplasm of a variety of different adherent and suspension cells. The efficiency varies from 20 � 100% of the cells transduced and up to 50% of the input protein gets incorporated into the cells. Furthermore, caspases delivered to cells are functional and drive cells into apoptosis. The robust nature of these results show that BioPORTER reagent is effective for delivering a variety of different macromolecules into many different cell types.